Wolf Point, Montana | December 14, 2010 | Donna M. McNamara, M.Ed., Special Education Teacher at Northside Elementary School, has been recognized by Elite American Educators for dedication, achievements, and leadership in elementary education. Ms. McNamara has been working as a special education teacher for twelve years, with six years in her current position. As a special education teacher at Northside Elementary School, Ms. McNamara creates lessons and education plans, conducts assessments for special education students, coordinates strategies with mainstream teachers, designs individualized education plans, communicates with administrators, and teaches special education, mathematics and ability-based success for all reading groups. She recently received a master’s degree in curriculum and instruction from Grand Canyon University, Phoenix, AZ in 2006. Previously, she received a bachelor’s degree in elementary and special education from University of Great Falls, MT in 1996 and a Bachelor of Arts in history from College of Great Falls, MT in 1979. 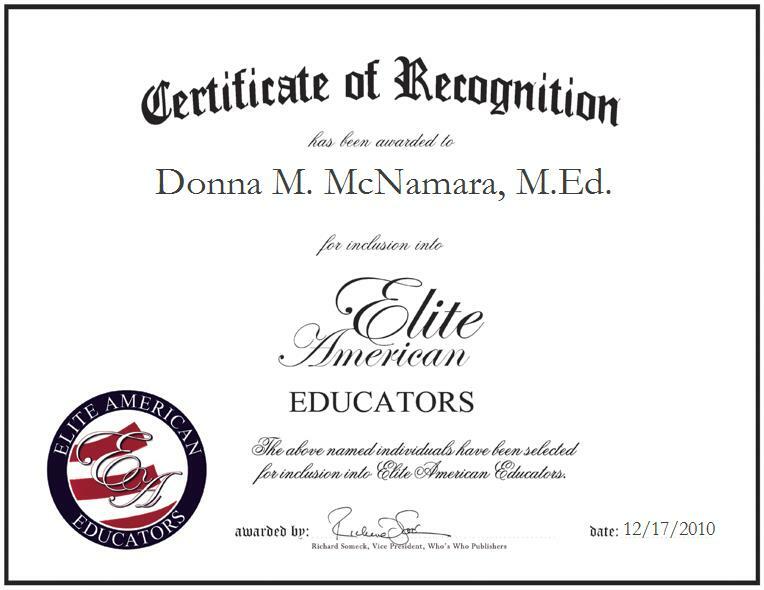 Ms. McNamara is certified as a special education teacher (K-12) and an elementary education teacher (K-8), in the state of Montana. Ms. McNamara notes one of most gratifying aspects of her career was participating in the Living History Program during the summer months and teaching the history of education in Montana. She does charity work for the Living History Program in Nevada City, as well as the Montana Heritage Commission. She worked as a head counselor at the Montana Heritage Commission History Camp, in addition to her career as a special education teacher. She is also associated with the Montana State Reading Council, Montana Education Association, National Education Association, and International Reading Association. She is also the recipient of the President’s Volunteer Service Award (2004-2009). Ms. McNamara attributes her success to her determination and desire to help others. In her spare time, she enjoys crewel embroidery, cross-stitching, sewing and studying genealogy. In five years, she intends to be helping children and become a reading specialist.